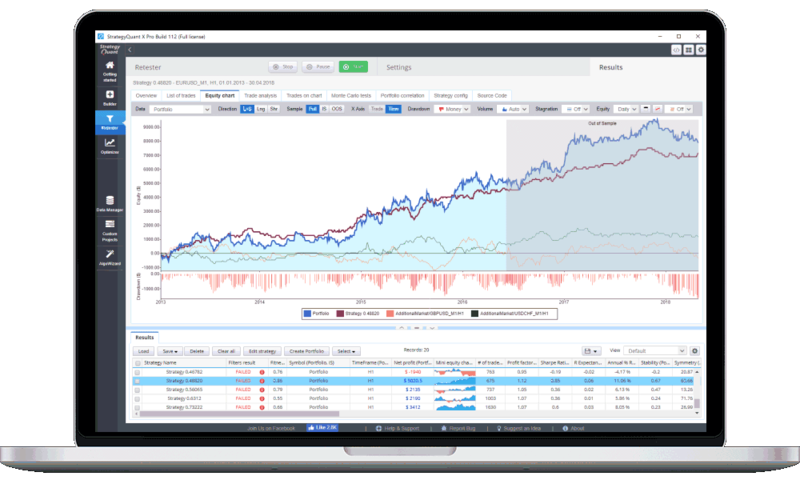 StrategyQuant X gives you the tools of professional quants and hedge funds. Build your own portfolio of trading strategies in a quantified way. point & click, easy to understand interface. Full strategy source generated. develop strategies that use multiple input charts with different symbols or TFs. make sure your strategies are robust and have real edge on the market. Improver, Walk-Forward Optimizer, Custom templates, Fuzzy logic and much more. It is able to generate and verify millions of different entry and exit conditions, order types and price levels, to find best performing strategies according to your selection criteria – for example Net profit, Return vs Drawdown, Sharpe ratio etc. Generate thousands of trading strategies based on advanced machine learning processes for different markets and time frames. Select only the best trading strategies based on results of advanced backtests, robustness and optimization tools. Create trading portfolio from proven strategies to succeed in changing market environment. There is never enough good strategies to trade. StrategyQuant X can help you find and evaluate new potential strategies or trading ideas. Algorithmic strategies trade automatically, they never forget, never make a mistake, they are not influenced by psychological aspects such as fear or greed. With its research capabilities and robustness tools you can find strategies that are statistically sound, based on a verifiable alpha / edge over the market. With automated workflow you can let the program do the work - generate and verify millions of trading strategies every day, while you can do something else.